Strictly speaking, rillettes are a kind of pâté made of pork cooked in its own fat and then finely shredded (very nice, despite the description!). 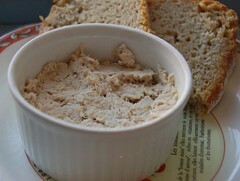 This version is a kind of tuna pâté, simple to make and delicious on toast. You need to use good-quality tuna, preferably “au naturel” rather than in oil — though you can use the latter if you drain it well. Make it at least an hour before you want to eat it; it will keep for several days in the fridge. In a bowl, finely shred the tuna, then add all the other ingredients except the seasoning and mix well. Add a little more cream if it seems too dry. Season with Tabasco, salt, and pepper to taste. Pack into a bowl or jar, cover and refrigerate for at least an hour before serving with toast. These are good! I’ve made them before but haven’t gone back to the recipe for a while. Some chives are delicious in them, too.